There is a wide selection of hymns in this book, including traditional Hymns of Praise, Thanksgiving, Easter, and Lent. Added to this rich array are the most popular Hymns of Christmastide and a collection of our most beloved Spirituals. They have been arranged in the keys that are most suitable for singing. The songs in this book include a rich selection of favorite American folk songs, patriotic songs, sentimental songs, and songs from other lands. They have been arranged in the keys that are most suitable for singing, and can be played in a variety of styles using only the words and the accompanying chords. Thirty-one Christmas songs from all over the world arranged for autoharp or chromaharp. 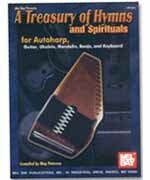 The arrangements in this book assume that the player had mastered simple strumming techniques and knows the fundamentals of autoharp playing.